Can a Swim Spa Be Salt Water? Posted on January 22, 2019 January 22, 2019 , in Swim Spas. When you imagine a clean swim spa or hot tub, you are probably assuming it is due to a carefully balanced chlorine system. However, some owners have found themselves with crystal clear saltwater swim spas that are gentle on their skin. If you have wondered if swim spas can be salt water and how they work, keep reading. In the following article, we discuss the difference between your traditional chlorine swim spa and a saltwater system. This way you can know what will be best for your personalized situation before you buy a new swim spa. Government health agencies typically only recognizes two types of swim spa sanitization, chlorine and bromine. You will learn more below about how a salt water system uses these chemicals in their sanitization process. Of the two options, bromine is the more popular one. This is because it is a gentler chemical and does not depend as much on pH levels. However, chlorine is more powerful when it comes to sterilization. 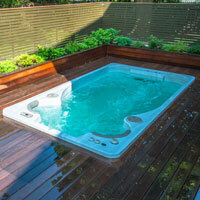 This makes it a favorite for hot tubs with frequent usage, like day spas or hot tubs belonging to large families. While each have their strength, it is important to note that both can be easy to use. To use, tablets or granules with measured amounts are placed into the floater or tub. Owners will find that these are the cheapest options when it comes to chemical requirements while allowing flexibility with water chemistry and strong effectiveness. Salt water swim spas have been around for awhile. Although, to be clear, you should know that a salt water system isn’t the same as ocean salt, table salt, and is not completely chemical free. People often assume because a swim spa is saltwater, it does not have chemicals. They still rely on either chlorine or bromine to some extent but the amount is much less, allowing the water to feel softer and more soothing to the skin. When saltwater systems were first introduced, they would take massive amounts of both chlorine and bromine salt that was added to swim spa water. That salt was then converted by electric salt generator using a passing electrical current via water. Although today that process sounds a bit intense, it actually worked but left users with a few issues. Common issues included corroded swim spa components, elements, pumps, and even the salt water generator itself. The slower conversion method struggled sanitizing swim spas, especially those that had higher amounts of bacteria. This eventually led to a build-up or bad smelling water. Luckily, this method is over and salt water options have advanced greatly. Salt water swim spas have improved their technology drastically. They have plenty of options for self-cleaning salt water swim spas. One salt water solution that has been recognized as being one of the smartest, simplest, safest, and most cost-effective is the Ez Ultrapure Salt Water Bromine System, manufactured by Gecko. This salt water system is featured in many Hydropool swim spa models. This system uses much less chemicals when compared to similar salt systems, in addition to featuring hands and maintenance-free capabilities. Once the startup process has begun, the salt system takes care of the rest. Including producing bromine sanitizer. Adjustments, if necessary, to the bromine level can be done via the swim spa keypad. This is easy to do since the bromine is self-generated which also reduces the amount of confusion with chemicals or pH levels. The benefits for salt water systems do not end there. These systems are smooth on sensitive skin, scent free, free of eye irritation, and do not irritate the lungs. With all these benefits, it is no wonder that the Ez Ultrapure system is recognized as one of the greatest swim spa sanitizing systems, in both the saltwater and non-saltwater categories. Do salt water swim spas sound appealing to you? Consider talking with your local swim spa dealer. They will be able to explain the various systems, maintenance involved, and cleaning capabilities. If you want to learn a bit more about the swim spas we have available, click here to download our buyer’s guide.